Popular choice of flexible cable where there is requirement for mechanical protection. The clear outer sheath, flexible and tough provides excellent protection against abrasion and oil. 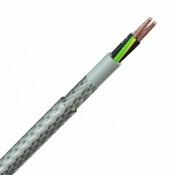 Used as a control or supply cable for machinery, plant, motors and other applications. Fine copper wire strands to IEC 60228 Class 5. Black PVC insulation with white numbers or coloured core identification. Cables with more than 2 cores include a green/yellow earth, cores twisted together. Grey PVC inner sheath, steel wire braid, clear PVC outer sheath.